About Leaper For more than 15 years, Leaper is specialized in creating various backpacks to satisfy with every customers need. 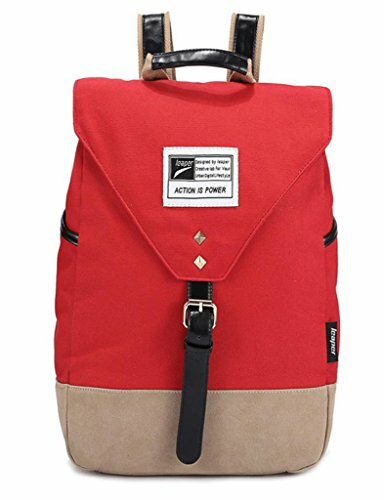 The products include Laptop bags, casual backpack, daypack, travel bag, outdoor bag, school backpack, rucksacks, and toiletry bag and so on. Our bags are upgrade fast to keep with global fashion. And we develop our bags by studying the feedback data that receiving from our customers. Now, our products were exporting to more than 20 countries, such as Europe, America, Middle East and Australia and so on. We are trust that we can be your best partner and give our best service for you! Thank you! Specification: Material: High quality Canvas Size: 11.2*15.7*4.7 in (L*H*W) Color: dark gray+red, beige+gray, red+gray Feature: 100% Brand New High volume Backpack with laptop lining This bag can accommodate a 14-inch-computer Unique design adjustable straps ease the pressure on the shoulder Side pockets on both sides of the bag, can place phone bottle umbrella, etc Front compartment has organizer with media pocket, multiple open pockets Package Content: 1 pc Laptop Backpack Note: Since the size above is measured by hand, the size of the actual item you received could be slightly different from the size above. Meanwhile, please be reminded that due to lighting effects, monitor's brightness / contrast settings etc, there could be some slight differences in the color tone of the pictures and the actual item.